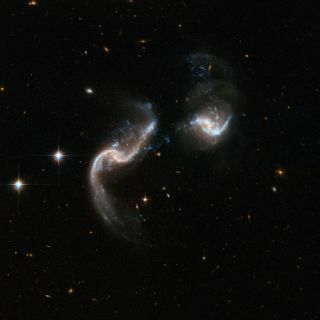 These two spiral galaxies are in an early stage of merging. They have strongly disrupted shapes and an astonishing number of blue knots of star formation. The system, Arp 256, is located in the constellation of Cetus, the Whale, about 350 million light-years away. A new website will let people play a form of "cosmicslot machine," matching up images of colliding galaxies with millions ofsimulated mash-ups to find the best model. Astronomers call these cosmic collisions "galacticmergers." Studying these mergers could explain why the universe hasthe mixof galaxy types ? from those with wound-up spiral arms to compact balls ofstars ? that it does. And it turns out that the human eye is much better than acomputer at matching up images of real mergers with randomly-selected images ofsimulated mergers. The new website aims to put this human talent to use. Galaxy Zoo Mergers, which goes live on Nov. 24 athttp://mergers.galaxyzoo.org is an international project led by scientists from Oxford University in the U.K. and George Mason University in Virginia. "Visitors to the Galaxy ZooMergers site use what?s rather like a giant slot machine, with a real image ofa galactic merger in the center and eight randomly selected simulated mergerimages filling the other eight 'slots' around it," said Chris Lintott ofOxford University?s Department of Physics and a galaxyzoo.org team member. "By randomly cycling through the millions of simulatedpossibilities and selecting only the very best matches they are helping tobuild up a profile of what kind of factors are necessary to create the galaxieswe see in the Universe around us ? and, hopefully, having fun too!" Lintottadded. Users can do more than simply select images, they can alsotake direct control of the simulations ? choosing 'more' or 'fewer stars' or'flipping' galaxies ? in order to provide an exact match to what we see in theUniverse. "Whilst we're challenging the 250,000 existing users ofthe original Galaxy Zoo site to take part in this new project, anyone iswelcome to join in ? you don't have to be an expert, in fact our evidence showsthat not being an expert actually makes you better at this sort of task," saidGeorge Mason astronomer John Wallin. The project will focus on around 3,000 images of realgalactic mergers identified through the Galaxy Zoo project ? it also featuressome new images of these mergers taken by the HubbleSpace Telescope. The next stage will be to investigate the 'before' and'after' of these colliding galaxies to work out what caused them and what willhappen next ? rather like trying to capture the slow motion detail of themoments before a car crash and predict the aftermath. "These collisions take millions of years to unfold andso all we get from the Universe is a single snapshot of each one. By producingsimulations, we will be able to watch each cosmic car crash unfold in thecomputer," said Anthony Holincheck, a graduate student at George Mason University and galaxyzoo.org team member.